We used the Melissa & Doug Rainbow 6 Color Stamp Pad and Center Enterprise Washable Primary Stamp Pad. They both worked well, but the Melissa and Doug ink pads aren't as big. The pads on the Enterprise inks are about 3" wide. 3. 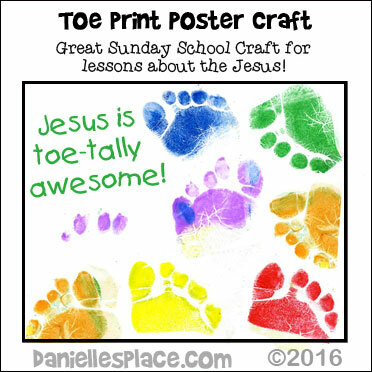 If the finished toe print paper looks kind of messy, you can cut out the toe prints when the paint or ink is dry and glue them to another piece of paper. ©2016, Digital by Design, Inc. - See Copyright Information - Bloggers, if you use this craft idea or an adaptation, and link back to this page for the complete directions, let us know and we will put a link to your blog. 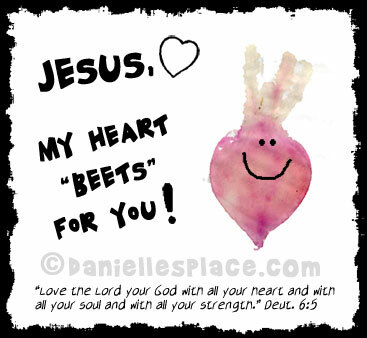 Children use real beets to make heart "beets"
3. In class have your children press beet halves onto their papers to make imprints of the beets. If you don't want to use cooked beets, you can have them trace around the outside of the beet. Woodsies Mini Jumbo Craft Sticks - Natural 4.5" 50/Pkg - Use good quality craft sticks that lay flat. The 5/8" work perfect with the one-inch tape. *You can use the Woodsies Jumbo Craft Sticks with the 1.5 Inch - 3M Scotch Masking Tape for a bigger Canvas. You can make this craft even easier for younger children. Just have them place six or more crafts stick one on top of the other in a row and then glue two other craft stick perpendicular to the row of craft sticks. To keep the craft sticks together while they are gluing them you can place a piece of tape across the row of sticks. Attach a piece of yarn to to top so it can be hung up. You can also use the Colored Jumbo Craft Sticks or the regular-sized Colored Craft Sticks so they don't have to paint them. View a Video on Youtube showing how to make this craft. ©2012, Digital by Design, Inc. -* See Copyright Information - Bloggers, if you use this craft idea or an adaptation, you must link back to this page for complete directions. If you use this technique, let us know and we will put a link to your blog. 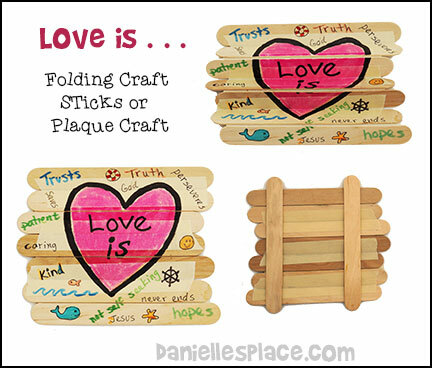 In this game children learn what it means to love with this fun paper plate game. They take turns opening the heart door, pulling out a heart-shaped card, and reading it. Then they say whether or not the words describe love or not. Each card contains words from 1 Corinthians 13:4-7 and their opposites. Children make take-home Valentine bags with heart-shapes that contain words describing love. At home they work on showing love. When they do something that is loving described on the hearts, they can put that heart in their bags. Send home some blank hearts so parents can add other loving activities that their children need to work on. 1. Draw a heart shape in the center of one paper plate Cut the heart shape out using an E-an X-acto Knife and Scissors but leave about one inch connected to the plate on the left-hand side of the heart. 2. Paint the paper plate with watercolor paint and let it dry. Decorate the paper plate with stickers and foam shapes. 3. Write "Love is . . . " in the center of the heart, or use the heart pattern and glue it to the heart. 4. Glue the paper plate to another paper plate, top to top to form a basket. 5. To finish glue a bead or button on the heart to use as a handle to open the heart door. 6. Cut heart shapes from colorful paper and write different things that love is from 1 Corinthians 13:4-7. Also write the opposite of what love is. Place all the hearts in the paper plate heart basket. In class let your children take turns opening the heart door and picking a heart. Read the heart and ask the child that picked it if it is an example of love. Keep playing until all your children have had a chance to pick a heart. 7. Have your children decorate bags with hearts and write the words "Love is . . ." on the front of their bags. Cut out hearts shapes and write things about love that the children can work on at home. Tell them that when they do something that is written on a heart, they can place that heart in the bag. They can bring the bags with the hearts to class the next week and share with the class what they did. 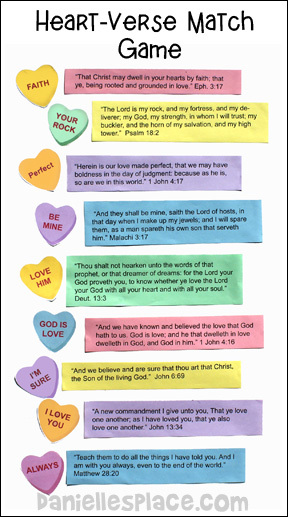 This is a great color sheet to use for your Sunday School class near Valentine's Day! 2. In class have your children color or paint the picture. As they work talk to them about what the Bible has to say about love. 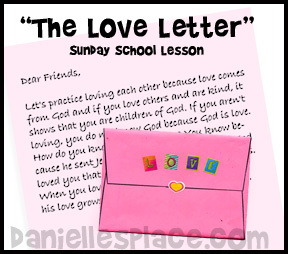 The following crafts and learning activities come from the Sunday school lesson "The Love Letter" on The Resource Room. Memory Verse: 1 John 4:7, "Let us love one another: for love comes from God." In this lesson children learn that the Bible's message of love is meant for everyone at all times. 1. Before Class cut out eleven hearts from construction paper for every three children in your class. 3. As the children arrive hand a set of eleven hearts to every two or three children depending on how large your class is. Encourage them to help each other put the hearts in order to make the memory verse. 1. 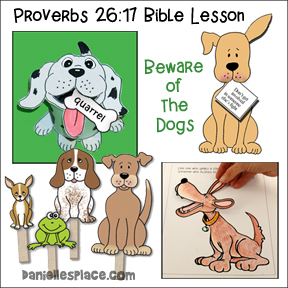 Before class print out the heart patterns and the Bible verses onto different colors of paper. 2. Cut the hearts out and the verses apart. 3. In class spread out the hearts on a table so the children can see them or tape them to a bulletin board. 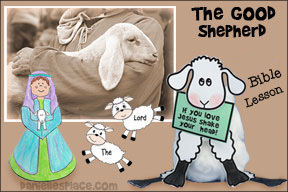 Assign each child, or group of children, one of the Bible verses. Have them look up the verses, read them and decide which of the hearts go with their verses. 4. Have each group of children read their verse and explain why they picked the heart they picked. Check the bible verse list to see if they are correct. 5. 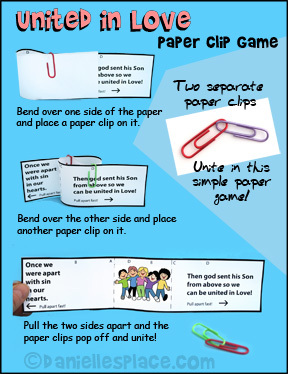 Staple the corresponding Bible verse on the bulletin board and have one of the children tape the matching heart next to the verse. 6. If you don't have time to split the children up into groups, you can give each child a heart and then read a verse and staple it to the bulletin board. If a child thinks he has the matching heart, he can raise his hand. If the heart matches he can tape the heart next to the verse. In class have your children cut out the heart shapes and glue them to the grid in any order they would like. They will have one heart left over. When they are done preparing their Bingo cards play the game. To play have the children take turns picking one of the letters L, O, V, or E and then read one of the Bible verses that go with the hearts and ask your students which heart they think matches the Bible verse. When they have guessed correctly let them place a marker on the heart if they have it on their board under the letter the child picked. Remind them that the matching heart must be under the right letter. If it isn't, they can't put a marker on it. The child who gets four in a row first wins. 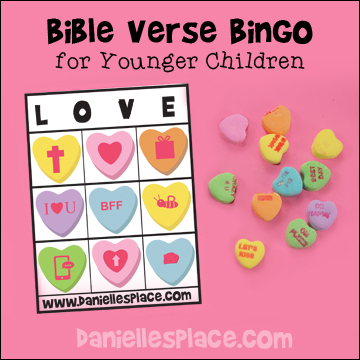 Twenty Bingo Cards with hearts that represent nine different Bible verses. These are great for younger children who cannot read. To win they must get three markers in a row to win. Instant Download Pattern $2.00 - - Includes 20 printable Bingo cards - 4 per page. 1. Before class cut out a large heart from a piece of poster board and glue it to the center of the poster board. 2. Print out the small hearts onto brown paper and cut them out. Glue them around the pink heart. 3. Print out the Love title and glue it to the center of the large heart. 4. Cut two matching heart shapes from pink craft foam. Glue them together around the edges leaving a one inch opening. Stuff the heart with tissues or crinkled up paper and glue the heart closed. The object of the game is to get as many points as you can by throwing the heart onto the pink heart in the middle. Break your children up into teams and have them take turning tossing the heart. 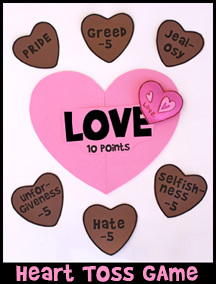 If the heart lands on the pink heart they get 10 points. If it lands on a brown heart or is touching the brown heart they lose 5 points. If the heart lands on a brown heart, ask the child to read the word on the heart and give an example of how that word doesn't show love. For example, if the word is unforgiveness, the child may say, "If someone calls me a bad name and I don't forgive him, I'm not showing love." 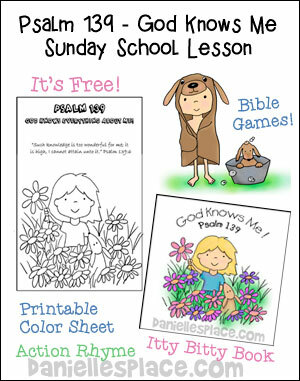 The following crafts and learning activities come from the Sunday school lesson "Love Is" on The Resource Room. 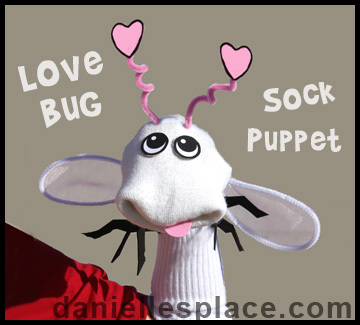 The lesson is taught using a puppet skit and a "Not-so-loving Love Bug" puppet that doesn't quite understand what it really means to love someone. 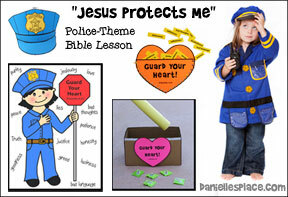 Through this lesson children learn what the Bible teaches about love in 1 Cor. 13. Many crafts and activities are offered to reinforce the concepts. A printable card game is included with four different card game suggestions for different age levels. Patterns for these crafts are available on The Resource Room. 1. Before class cut one dinner-sized paper plate in half. Glue one half to another diner-sized paper plate to make a pocket. 2. Fold a snack-sized paper plate almost in half as shown in the picture above and then fold back the two upper corners to make the face shape as shown in the picture below. Fold a pipe cleaner in half and tape it to the back of the head. Glue the head to the large paper plate pocket. 3. Print out the Leg, Eyes, and Wing Patterns. Cut the eyes out and use the leg pattern to cut leg shapes from black construction paper. Use the wing pattern to cut wing shapes from tissue paper. 4. Write parts of the "Love is" verse on fun foam or paper hearts - "love hopes, is patient, is kind, does not boast, etc. 5. 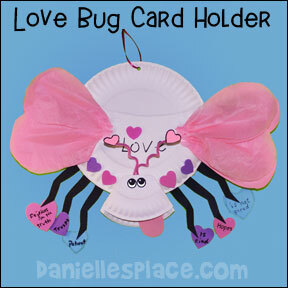 In class have your children glue on the legs, eyes, and wings, and decorate the love bug with hearts. They may also want to add a tongue. Have them write the word "love' on the bug's back..
6. Use a hole punch to punch a hole at the top of the bug and tie a ribbon to the hole so your children can hang the card holders. 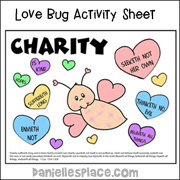 (Younger Children) Before class print out the Love Bug Cards onto heavy card stock. If you have a large class, print out more than one set. Place all the cards in a bag and mix them up. 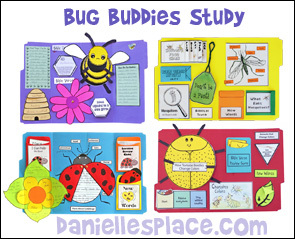 Tell your children that you caught a lot of bugs, some are "love bugs" and some aren't. Have them take turns reaching in the bag and pulling out a card. 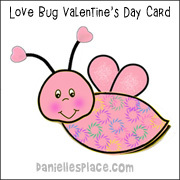 If the card is a "love bug", the child gives an example of how we can love from what is written on the card. For example, if he pulls out a "Love is Kind" card, he may say, "We can be kind by giving to others." That child can then get a snack. If a child picks a "bad bug", he doesn't receive a snack this time, but will have another chance to pick a card his next turn. 1. Play "Go and Find the Bugs"
(Younger children) Use just enough cards (from above activity) so that you have one card for every child and each card has a match. If you don't have any even amount of children, have a helper play the game. Before class hide the cards around your room. On the word go, the children should all try to find one card and then try to find the other child in the class who has the matching card. Use the cards from the above activities, but print out a matching set. Remove all the "bad bug" cards except for one. Turn over all the cards and let the children take turns trying to find matches. If a child turns over a "bad bug" card, he loses his turn. Make sure the children turn the cards back over and place them in the same location each turn if they don't match. 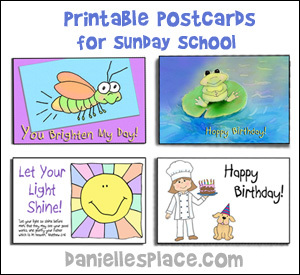 Each time a child turns over a card, read what it says on the card to help them remember the Bible verse. This game is played like "Go Fish" and "Old Maid" combined. The object of the game is to not get stuck with the "bad bug" card at the end of the game. Before class print out two sets of cards for every three students. Remove one "bad bug" card from every set. You should have only one "bad bug" card per set of cards. Place your children into groups of three, and have them pass out all the cards between them. One child will have an extra card, that child should start the round. If a child is holding any matches in his hand, he places them down in front of him on the table. Children then take turns asking someone in their group if they have a certain card. If the child they ask has the card, he has to give it to him. If the child doesn't have the card, he says, "Go buggy" and the child asking must pick a card from his hand. If a child matches all his cards and places them on the table in front of him, he is out of the game until the next round. When all the cards have been matched and placed on the table in front of the children, the child left holding the "bad bug" card is out of the game. The remaining three children then start a new round. They play the same way, and the child who is left holding the "bad bug" card in the second round is out of the game. The two remaining children play the "play off" round to see who will win. They don't ask each other if they have a certain card, they just take turns picking cards from each other. The child who isn't left with the "bad bug" card wins the game. 1. Print out the pattern. 2. Use the mouth pattern to cut a mouth from heavy cardboard. Fold the cardboard mouth in half and insert it in the toe of the sock the rounded part towards the toe. Push the toe of the sock into the fold of the cardboard mouth. 3. Cut out the eyes and glue them to the head. Punch tiny hole above the eyes and insert the pipe cleaner through one hole and back up through the other hole. Fold the ends of the pipe cleaner up and bend them around a pencil. Glue heart to the end of the pipe cleaners as shown in the picture. 4. To make the wings bend pipe cleaners so the ends meet and glue the ends together with hot melt glue. Spread the wing material out flat on a newspaper. Place glue all around the pipe cleaner wing shape and press the wing shape down on top of the material. Lift up the wing so it doesn't stick to the newspaper. When the glue is dry, cut around the edge of the wing. Glue the wings to the back of the puppet as shown in the picture. 5. Cut legs from black fun foam or black poster board. Glue the legs to the front of the bug puppet. Cut a tongue from pink fun foam and glue inside the mouth. 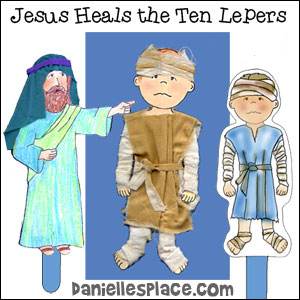 Each child colors a paper doll to look like him or her and then they are taped together to make a long chain. 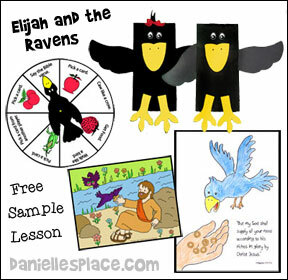 See the Martin Luther King, Jr. Crafts and Learning Activities Page for directions and free patterns. The paper says, "Once we were apart with sin in our hearts. Then God sent his son from above so we can be untied in Love." 2. Bend the left side of the paper at dotted line A, but do not fold. The two B's on the paper will touch. Place a paper clip over the B's. 3. Flip the paper over left to right. so that the paper clip is on the right and you can't see any words. 4. Bend the right side forward at dotted line C so that the D's touch each other back to back. Place a paper clip where the two D's meet as shown in the diagram. 5. Read the poem on the folded sheet and then pull the two side apart quickly. The two paper clips will pop off of the paper and join together! Children take turns spinning the heart in the center of the game, and then determine which word the heart is pointing to, and give an example of how we can show love in that particular way. 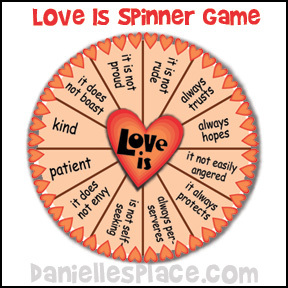 For example, if the spinner lands on "Love is kind", he may say, "We can show kindness by giving to people in need." 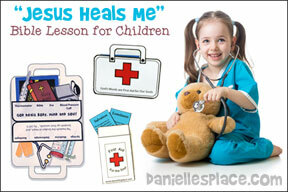 Teach your children what it really means to love using this series of lessons. 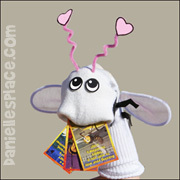 Each lesson is presented with a caterpillar puppet named Squirmy. Your children will learn from Squirmy worm about growing fruit and growing the fruit of the Spirit. 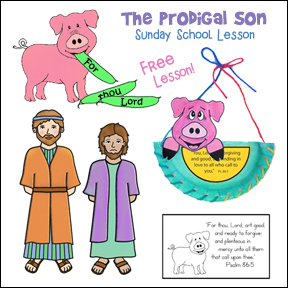 This series includes a fruit bowl Bible verse memory chart, Bible verse cards, bulletin board displays which your children can help produce, and lots of crafts and activities to reinforce the lessons. A Free Sample Lesson is available on the Sample Lessons Page. 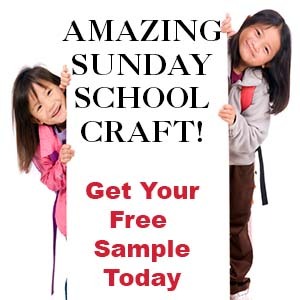 You can also see a complete list of the lessons in this series with lots of examples of the crafts and activities available on the Fruit of the Spirit - Bible Crafts and Activities for Sunday School Page. 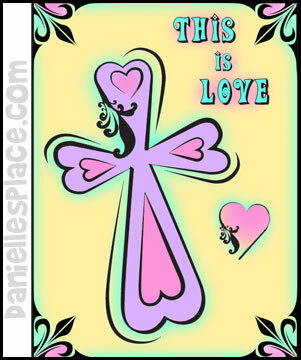 Nature's Greeting Magic Plant- "I Love You"
Say-It Poster Chart - I Love Jesus!